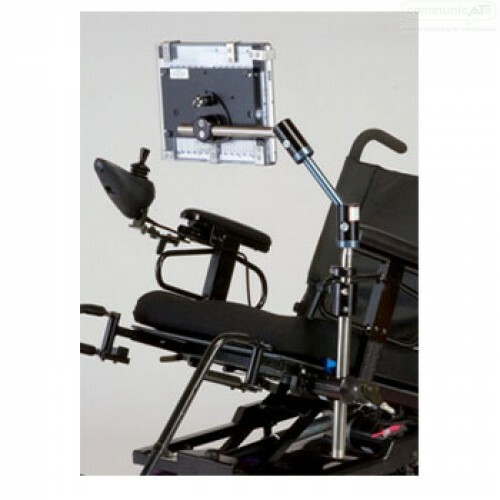 The DAESSY Positioner Mount is a very versatile mounting system for when accurate device positioning is a priority, like for eye-gaze access technologies. Up to 40cm of height adjustability. The DAESSY Positioner Mount gives the ability to achieve the ideal mounting position for technology. A very versatile system for when accurate device positioning is required, like for eye-gaze access technologies. 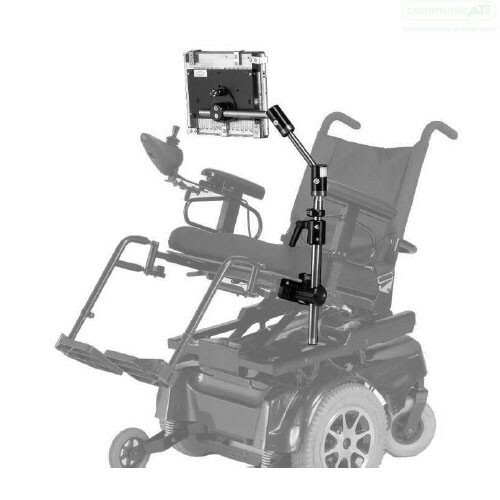 The DAESSY Positioner Mount can be used on any type of wheelchair or alternate location. The Removable Frame Clamp Receiver of the frame clamp assembly has a lock mechanism that can be engaged to secure the mount for use on a tilting seat system. Two 360°articulating ball joints provide infinite positioning possibilities with each articulating joint locks independently. Once a rotation and position is selected each articulating joint must be tightened and locked individually with an allen key to secure the position. The attached device’s horizontal position along the tube is adjusted by the location of the quick release base. 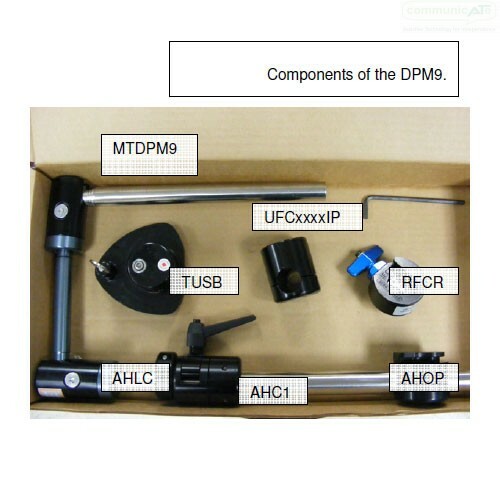 The DAESSY Positioner Mount – DPM9 has 40 cm of vertical height adjustment. An adjustable height clamp with quick handle is easily unlocked to change the vertical tube height through 20 cm of adjustment without tools. When locked, the Adjustable Height Clamp securely holds the mount tube in place. It is doubly secured by a small locking pin which also acts as a locater for the best "in-use" positioning, giving automatic repositioning when rotated out of the way. The vertical tube is also adjustable with an allen key through 20 cm at the point of the Adjustable Height Outer Piece (AHOP). The Adjustable Height Outer Piece attaches to the vertical tube and fits into the Frame Clamp Assembly. With Positioner Moint, the Removable Frame Clamp Receiver is the standard version. The attached device angle can be adjusted at the top articulating joint and height and distance at the bottom. A very versatile system. When installed on a tilting seat system, the seat and mount should be in the upright, vertical position when making adjustments and all joints must be tightly secured prior to tilting the seat and mount. Although the DAESSY Positioner Moutn has excellent positioning power, often with Eye-gazed access technologies there is an additional need to adust at the device connection - the Quick Release Base. Communicate AT can upgrade your DAESSY Positioner Mount to include a DAESSY Articulating Quick Release Base in preference to the included standard Quick Release Base. This upgrade pathway allows for a more efficient and versatile adjustment method for mounted eye-gaze systems and gives the option of doing so "on-the-fly" or when required without tools or as needs change. 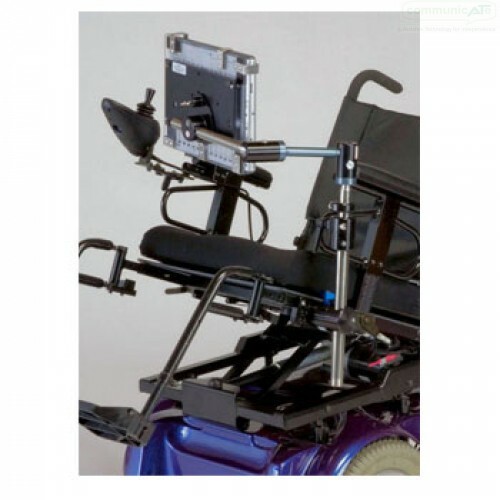 The main benefit is it can all be performed at the point of attachment without adjusting the rest of the mount kit e.g. giving the screen an offset downward angle to allow for best eye-gaze access calibration.